Scheduled to come to a vote in Congress tomorrow, the Paycheck Fairness Act is a bad solution to a statistically trumped-up problem. The most frequently cited statistic is that women earn 77 cents for every dollar a man makes. However, not all of that gap can be attributed to discrimination. The Bureau of Labor Statistics reports that comparing male and female full-time workers, men work more hours: 8.2 versus 7.8 hours per day, on average. Just assuming an exactly even hourly rate, we'd expect women to earn 95% of men's total on a yearly basis; however, there are also more women working part-time than men, widening the gap further. 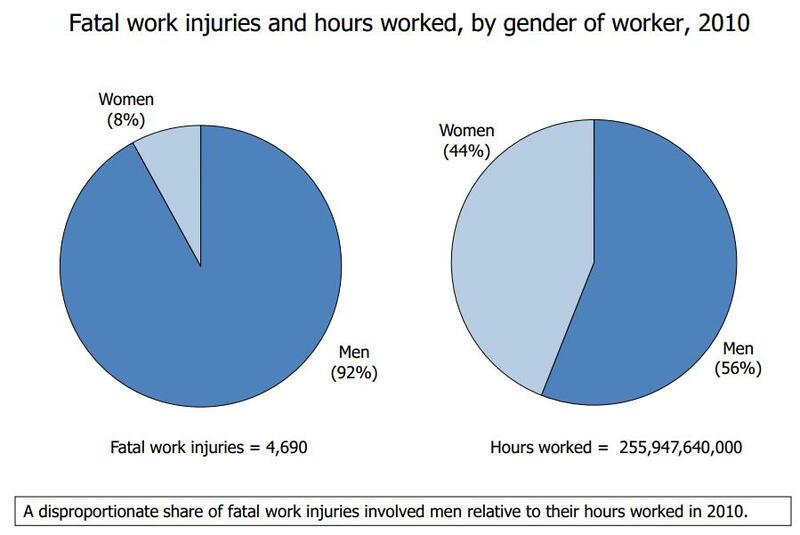 Men are also disproportionately likely to die from an injury on the job, as this chart shows. Source: US Department of Labor, Bureau of Labor Statistics, Current Population Survey, and Census of Fatal Occupational Injuries, 2012. But put aside those statistical details. A gap in male-female wages undoubtedly remains, and some of it is probably due to gender-bias and discrimination. What does the Paycheck Fairness Act do to fix that? The Act would strengthen the Equal Pay Act of 1963, which already requires similar workers be paid the same. The new legislation would expand the damages that women can claim in court, and give women more tools to sue their employers if discrimination is suspected. The new law would result in effectively unlimited liability for a business sued for giving unequal pay. Put yourself in the shoes of a small business owner. Suppose you are considering hiring either a male or female employee for an entry-level position. Suddenly knowing that your business could be shut down if a court decides your payment to the woman is unfair, who would you be more inclined to hire? Let's think of another group that has been "protected" by sweeping federal legislation. Persons with physical disabilities are given additional tort resources by the Americans with Disabilities Act if it's found that they were treated unfairly. A paper by Acemoglu and Angrist (2001), using reliable econometric techniques, found that employment of disabled people dropped substantially following the ADA's passage. Now, twenty years later, physically disabled persons are unemployed at record levels. There are obvious weaknesses in the analogy between the Paycheck Fairness Act and Americans with Disabilities Act - women are a larger segment of the population, and aren't physically limited from doing most jobs - but a lesson remains. Creating new protected classes of workers is not always to that group's overall benefit. Even well-intentioned laws may end up punishing businesses for hiring certain workers, which hurts both individuals and the economy as a whole. The Paycheck Fairness Act is almost certainly dead in the water; even without passage, its political purpose will have been achieved. But, if President Obama and the Democrats want to show they are helping women, a first step is to not shut them out of the labor market.